I was not raised in a "sports" family. We weren't crazy fans and we didn't camp overnight for tickets. But we have always loved our local teams and big sporting events like the Olympics or the 1985 World Series (go Royals!) and my parents loved watching college football (my mom loves Notre Dame). A fan even at age 6. As I grew older I started supporting my teams more. 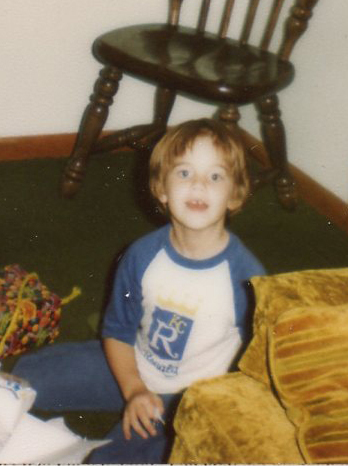 I went to many Kansas City Royals and Chiefs games and the Kansas City Wiz/Wizards, now called Sporting KC. Being a die-hard Kansas Citian, I grew in to a huge fan for all three teams. What you won't do for love. 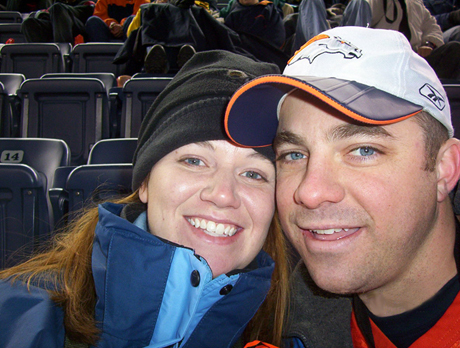 My husband and I at a Broncos game in 2005. And then I met my husband. Originally from Colorado, he is a die-hard Broncos fan. (There has been no living with him since they acquired Peyton Manning.) Needless to say, we are a house divided. My husband's love for football has rubbed off on me and now we look forward to football season each year. My Chiefs continue to struggle and the Broncos are beginning to thrive. Alas, it doesn't matter who wins because we can enjoy watching as a family. I love and hate the Super Bowl. It marks the start of the winter of our discontent. The last game of the season. We must wade through the sports black hole until baseball begins in April (note here that I am not a basketball fan). However, it is a fun experience to watch, especially with a group of friends. I have no allegiance to the teams playing, but it doesn't really matter. It's all about the game. Have fun watching today and here's to a quick return of football! I busted out laughing when you talked about the Broncos acquiring Peyton Manning. I love college football, but am not so into pro football. If the Patriots won last week, I might be watching the Super Bowl. I can relate to the "season of discontent"--for me it starts the first week or two in January after the BCS championship game. Good luck with your genealogy research. Thanks for stopping by my blog. Thanks, Lori! Yes, growing up the end of bowl season was a sad one for us, too. Here's to a quick summer!